• The Link: "Is it just me or is there a heart-shaped shadow over this card?! This new one has been selling like hotcakes in the online shop and yesterday I spotted it at one of my favorite stores in Silverlake @yolksilverlake! 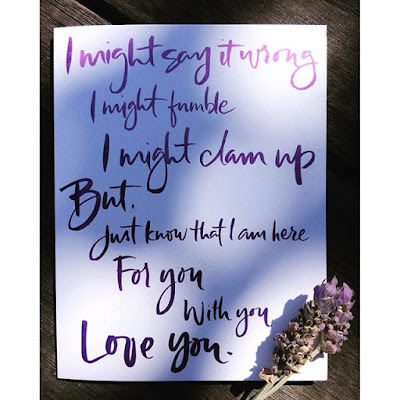 When I decided to do the two new pregnancy loss cards with a focus on partners, my husband and I talked about what he wishes he had conveyed when it felt nearly impossible to find words. Here's what we conceived: I might say it wrong, I might fumble, I might clam up but, just know that I am here, for you, with you, LOVE YOU."